I love this nation but we have lots to learn from our neighbours to the south in terms of celebrating the culture of innovation -- not just celebrating accomplishments and successful companies, but creating an atmosphere where people are excited to just share their experiences and learn from one another. I slammed the door as I got back into my car. The clock read 3:59 p.m. -- exactly when my flight was supposed to leave Buffalo airport. I had just spent two hours waiting at the American border and as a result missed my flight to Austin for the South By Southwest Interactive Conference (SXSWi), an annual technology conference focused on startups. I'd have to spend the night in Buffalo and catch an early flight the next day. 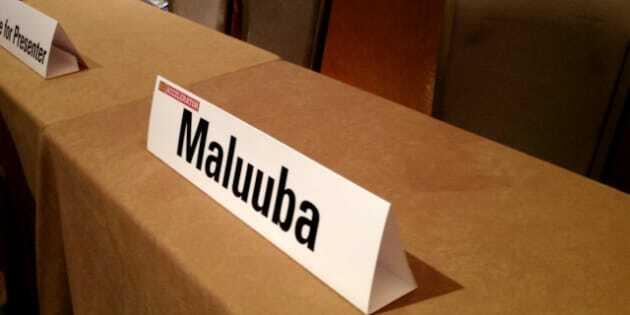 Our company, Maluuba, was selected for the SXSWi Accelerator program where select start-ups share their business ideas to win prizes and meet with high profile investors. Thousands of companies around the world apply so it's an honour even to be selected, especially as a small Canadian start-up. Maluuba, a voice powered personal assistant app (available for Android and Windows Phone), is a project we've been working on for the past two years ever since our last year at the University of Waterloo. Our company is an ambitious group of recent grads who sleep little and work hard. Our goal is to revolutionize how people search on mobile by allowing them to speak naturally to their phone -- without needing to learn rules or commands. By building extensive Natural Language Processing techniques, we've created a powerful experience where users can ask Maluuba a wide range of queries in plain-speak, covering everything from restaurants to music to shopping to even reminders and calendars, and receive exactly what they asked for. For our pitch at SXSWi, I was presenting our latest feature, TV search, that allows users to find what's playing. One can ask questions about specific shows such as "When is Big Bang Theory playing?" or ask more general queries such as "What comedy shows are playing now?" or "What's playing on TSN on Friday?" and receive air times and information about show. It's significantly faster and easier to use than flipping through a clunky TV guide -- we think it's a game changer. I arrived in Austin the next morning, a few hours before my presentation. The room was packed and a long line had formed outside waiting to get in. I sat down anxious to deliver my pitch. We were allotted two minutes to make the pitch, so it needed to be concise and powerful. Our turn was next. I described Maluuba, showed a demo, shared our vision and introduced our hard working team. The two minutes went by so quickly they felt like 20 seconds. It was a relief to receive a warm reception from the audience. The judges asked insightful questions which showed they were intrigued by the product. After the presentation, I was approached by a few interested parties and exchanged contact information. All in all, it was a success. With that load off my shoulders, I could now actually walk around the event and take it all in. In just a few minutes I noticed something about SXSWi that I didn't initially understand; the event is not merely a forum for networking and idea sharing for technology start-ups, it's a celebration of the start-up culture. It celebrates the journey of a start-up; the notion that someone with an idea, passion, creativity, can do something of value and build a business of great size. The talks by the industry experts were insightful but they didn't come off as merely pieces of business advice; they were about the stories that led each person to their goals. They were like interviews with recording artists or movie stars. For the attendees at SXSWi, technology start-ups are like sports teams; they attract a following. Attendees have their favorite start-ups, use their services, root for them, and follow their progress. It was refreshing to see the energy. That's something I wish I saw more of in Canada. I love this nation but we have lots to learn from our neighbours to the south in terms of celebrating the culture of innovation -- not just celebrating accomplishments and successful companies, but celebrating the journey, and creating an atmosphere like SXSWi where people were excited to just share their experiences and learn from one another. Canada is making its way there. With centres like the Communitech Hub in Waterloo and the MaRS Discovery District in Toronto, the support for start-ups is gaining momentum. These groups and others are an indication of the growing need to support the talent in this country, not just financially but through events like SXSWi that encourage their efforts. I spent the rest of my time at SXSWi visiting panels and meeting other entrepreneurs. I left the conference with inspiring stories, great insights and renewed energy to not only continue to work hard, but to pause and enjoy the journey of building Maluuba.